We will conduct our 1st Night Vigil of the year as scheduled on Friday, February 6, starting at 5:30 PM until 10:00 PM. Rev. Father Renny Kattel will offer Holy Mass, and lead the Novena as well as the Adoration. On behalf of the Spiritual Life Team, I cordially invite all parishioners to the Night Vigil. Please come to adore the Lord. Due to icy snow and dangerous driving conditions, (there is a weather advisory until 6.00 PM) we are compelled to cancel Morning Mass, Novena and Benediction today at 9.00 AM. Malayalam School and all other activities are also canceled for the day. Due to the inclement weather conditions, Malayalam School will be closed tomorrow (01/24/15). Thanks. 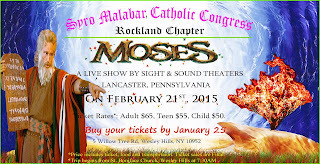 We have been getting several request for reservation for the show MOSES via telephone and emails. Please note that the reservation for this show MUST be made in person at SMCC's Help Desk on January 25th. We are not taking any phone/email reservations. Payments must be paid in full at the time of reservation and no refunds are allowed. 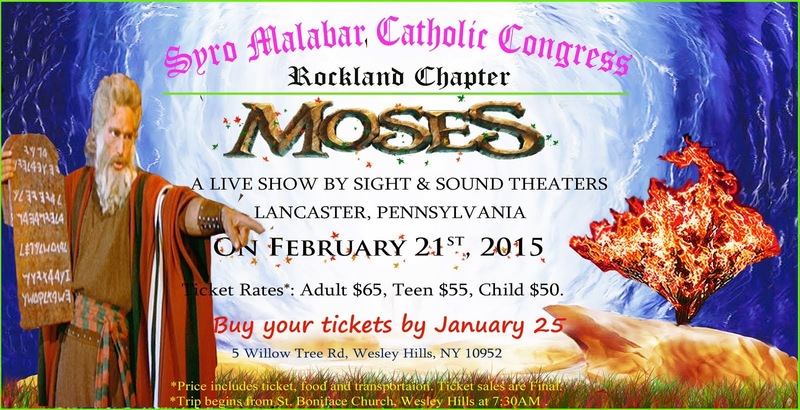 SMCC chapter is pleased to arrange a fun filled trip to Sight & Sound Theatre in Lancaster, PA to see the show "MOSES" on February 21st 2015 at 2:45 PM. You could also view a video highlights in this above link. If you are interested, please sign up at SMCC's help desk by January 25th. Please note that Bus capacity is only 56 passengers. So please make every effort to reserve your ticket ASAP. Malayalam school will be open as scheduled on 01/17/15 (Saturday), from 11.30 AM to 12.30 PM. Little angels choir practice – on 01/17/15(tomorrow) Saturday at 12.30 PM. Lunch will be served. Keyboard Lessons re-starting on 01/18/15 - Sunday (10 AM to 11.30 AM). New students – please bring a soft touch keyboard and stand. Old students – please practice your lessons before the class. Malayalam School – will be open as scheduled on 01/18/15 (11.30 to 12.30). Please see the link to the details about marriage prep course in the Bronx church. Please click on the below link to read news in detail. Before you leave your home today, please make sure that you have the tickets with you. If you purchased several tickets and intended to come at different time, please make sure that each group has their tickets with them. Additional tickets will be available at the front door. A "Location Map" pdf file is also attached for your information. Please forward this mail to all of your friends who purchased tickets for this event. Family Night tomorrow at 106 Hammond Road, Thiells (near Stony Point) 10984- Please read the email for important guidelines and details. FAMILY and FRIENDS NIGHT - Sat, Jan 10, 2.45PM to 10.30pm. Those who wish to do final touch ups and need to try on the real stage are welcome to the North Rockland HS for practice tonight up to to 8.30pm. Tomorrow, Saturday, the stage will be available only from 10.00am to 11.00am (just an hour). Please do not enter into any areas other than the green rooms and auditorium. Tomorrow all performers and helpers have to visit the Performers' Checkin counter at the school entrance to get their IDs. Tomorrow is the day we have been happily waiting for a few moths. So much planning and hard work have been put into this great and 5th annual event by all who are involved. I am very impressed by all the the practices and rehearsals that I have been witnessing. Every one involved, former and current trustees, the coordinators, performers, stage managers and about 550 people who bought passes are all exited about tomorrow evening. Please pray that we will have good weather and the night goes well as we have planned by the grace of Almighty! I wish every success to all who are getting ready to go on stage. I am sure that the audience also will have a very relaxing and enjoyable time. No adds will be allowed on the back screen of the stage. All adds and banners should be exhibited in the lobby at the school entrance. We will light the traditional lamp at 8pm to inaugurate the Family Year (2015) declared by our Chicago Syro Malabar Diocese. Msgr. Edward Weber will give us a short message thereafter. We will also honor and introduce our trustees at that time. All are welcome to the building at 2.45pm to start the Social Hour. You will need to present your tickets at the entrance and will have to accept and keep wearing your wrist bands throughout the program. You will be guided by our ushers and please kindly cooperate with the directions they give. First we enter the Cafeteria and once you finish your refreshments, you may proceed to the auditorium to be seated ASAP. Our own COCONUT BAND will be playing on stage from 3pm. So there is a reason for us to go in sooner. Dinner time will be 7pm to 8pm and, once you finish your dinner please return to your seats so that we can restart our more exciting part of the night at 8pm. With 48 acts to perform, we may be ending only by 10.30pm. From 4pm to 7pm - children and teens, and during the second half, from 8.30 to 10.30pm - youth, adults and senior citizens will perform on stage. We will also be playing the slides of all events of the past year on screen from 3pm to 4pm. Please stay until the end of all shows in order to encourage all our artists and organizers. Please do not hang around in the lobby while programs are continuing in the hall. We request every one to be seated except for needed break times. Also we will appreciate if all of us could watch the acts silently to respect the artists and our neighbors. Parents make sure that they keep children under supervision all the time. Keep your belongings safe. Tomorrow's weather forecast is good except that it is going to be between 25F and 18F cold. We are honoring 7 couples who celebrate their significant anniversaries and that will take place right before dinner time around 6.45PM. All seven couples will have seats reserved within the front rows. If you have more people to join, please call Shajan Thottakara by tonight at 845-548-6066 and you may pick up the passes at the ticket counter at the school entrance. We have around 800+ seats. But we need to plan for food for every one; so please call tonight and try not to walk in any one with out early reservation. You may also reply to this email if you wish to reserve seats. I take this opportunity to thank all performers, participants and organizers for their time talent and donations. My deepest appreciation also goes to our sponsors and continuous supporters. Thank you in anticipation for your cooperation. Little Angels choir will be singing for the St. Sebastian's feast day (01/18). Practices will be held on Next Sunday (1/11) after mass at 2.30 PM and on Saturday (1/17) at 12.30 PM. Key board lessons will be re-starting on 01/18/15 Sunday at usual time (10 to 11.30). New students are welcome. All parishioners who purchased our Family & Friends Night tickets, but not yet paid, are requested to make payments on this Sunday, January 4, 2015. Also, please note that we still have additional tickets available for sale. There will be a table set up by the help desk area in the church basement after Sunday Mass to receive payments and sell additional tickets.